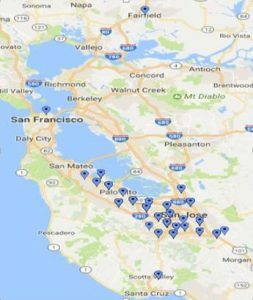 This map shows confirmed areas of the Bay Area where dogs have tested positive for canine influenza H3N2 as of January 22, 2018. Canine influenza is spread via direct nose-to-nose contact as well as via aerosolized droplets from coughing, sneezing and barking. Contaminated droplets can also land on surfaces such as floors and walls, food and water bowls, collars and leashes. It can also spread via people travelling between the sick and healthy animals. The virus (if it’s not killed by cleaning agents) remains alive on surfaces for 48 hours, clothing for 24 hours and on hands for 12 hours. The incubation period (the time before an animal is showing symptoms of the disease) is 2-4 days from when they are exposed. Unfortunately, dogs are most highly contagious during this time frame. Dogs continue to remain contagious for at least 21 days .Therefore the recommendation set forth by the American Veterinary Medical Association (AVMA) is to keep pets isolated and quarantined from other animals for at least 21 days. Virtually all dogs that are exposed will become infected with the virus – but only 80% will develop outward signs of disease. 20% will show no signs, however they can continue to shed the virus and spread disease. At this time, there is no evidence of transmission of canine influenza from dogs to people and no reported cases of canine influenza in humans. What should you do if your dog is exhibiting symptoms? Schedule an appointment with Watt Avenue Pet Hospital so we can evaluate your dog and recommend an appropriate course of treatment. The most reliable way to confirm infection is via a paired blood test measuring antibodies (which the body produces as a response to infection). We would draw a first blood sample within the initial 7 day window of your pet showing symptoms, and then draw a second blood sample 14 days later. The infection is diagnosed by comparing the samples – the second sample should show a marked increase in the number of antibodies, reflecting the body’s response as it fights off the infection. Another option is taking nasal and throat swabs for PCR testing – this needs to be taken within 3 days of the dog showing illness to be accurate. If this test is performed 4 days or more after symptoms have arisen, this test becomes less able to detect the virus. Treatment is mostly supportive – because canine influenza is caused by a virus, there is no medication available to treat it directly. Supportive treatment is often used to help them feel more comfortable and also to give them a better chance of fighting off the virus with their immune system. These treatments will be determined on a case-by-case basis. Examples of treatments include: antibiotics to fight off secondary bacterial infections and fluids if dehydration is present. In severe cases with pneumonia, often hospitalization is needed. Canine influenza vaccinations are available for H3N8 and H3N2. The vaccine that Watt Avenue Pet Hospital is giving is for both strains H3N8 and H3N2. This vaccine is important for dogs that will be at boarding facilities, grooming facilities, going to dog shows, going to dog parks or traveling out of state and within the state. With any flu vaccine (just like the ones people receive), there is always a chance that it will not be 100% protective, however it provides benefit in that often the symptoms will be less severe and the window in which their symptoms are present is often shortened. The vaccine is given as two boosters given 2-4 weeks apart. While vaccine reactions are always possible with any vaccine, we have not seen any increased evidence with this particular one. All dogs receive this vaccine annually if they socialize with other dogs. This would include dogs that go to dog parks, playgroups, boarding, grooming or dog shows. All puppies receive this vaccine before they are 4 months of age. The vaccine is $28 at vaccine clinics on Wed and Sat or if a yearly exam is due the exam is $35 and the vaccine is $28. A booster is done 3 weeks later.